The Minari engine is now on the ABM Miniplane Frame. The ABM Low-Hangpoint Harness system handles the torque really well, it's a completely different feel than when this motor is mounted on other frames - very balanced, very light and climbs straight even at full throttle as a result of the ABM arms. The ABM arms are "bent" in the opposite direction than the Top 80 and Polini 130cc units, as the Minari is a belt drive, and turns the prop in the opposite direction than the gearbox redrive. The frame is specific to the Minari, and will not work for other engines (you can't swap Top 80/Polini/Minari). This motor starts easily, and idles nicely right away, ready to give it's power! The Minari will require about 10 hours of "break-in". It is important to understand this and break this engine in properly. This way, the motor has the best chances of giving a long life of service. During the break-in, vary the throttle and do not use full power for more than a few seconds. See our Assembly Instructions for more about this. The power of the new Minari engine on the Miniplane ABM frame is remarkable. The unit's dry weight is 52.5 lbs and it has the same 12 liter tank for plenty of range. Now, pilots over 210 lbs, pilots at high altitudes or Tandem Instructors have a Miniplane Paramotor that will suit their needs! We now have available the Miniplane Minari 180cc and 200cc engines with a CLUTCH! These new additions are easier to start because you do not have to spin the propeller with the Pull Starter. We believe that this single feature makes this a much safer unit, but you still have to exercise caution whenever starting any paramotor - clutch or not. The Minari engines with a clutch feature the new "Easy Start" pull starter. This spring-assisted pull-starter makes starting the new clutch motors quick and easy! 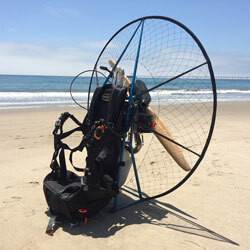 This may very well be the easiest paramotor you will have the pleasure of starting. It is easily done while on your back, the safest place to start your engine! 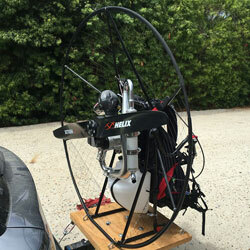 Miniplane Minari Paramotor comes standard with a Wooden Propeller and Miniplane Harness. Apco or SupAir Harness, E-Prop, Helix or Yueny Carbon Propeller are optional. See the Minari Engine Specifications here. Notice how straight the paramotor stays during takeoff! Just landed from the first flight, 42 minutes. Top temp: 406F, averaged 330F-355F or so. Top RPM 7900ish as you said. Varied the power immensely, stayed away from full except for brief spurts. Power was blubbery as you said but would expect it to even out with time and fine tuning on the mixtures. Power vs total weight ratio is incredible, I was walking around with this on my back and two thirds of a tank of gas like it was nothing. Torque is extremely well controlled. I'm surprised at how smooth the engine is, the vibration is quite minimal for such a large bore engine. I'm very excited about this set up Chad! So I got a Demo of the Miniplane Minari 180. I have to say I was very surprised in more than one way. Chad Bastian has really put some thought into the concept of making this unit launch great. Its 180cc quite a bit more power than I am used to flying with the top80. It was smooth transaction from start to 3/4 power once I was in the air flying. I did notice my wing set a tad behind me. I have never experienced that with the Top 80; I was like "where did my wing go?" lol.... I never felt foward arf or back when I would go from full throttle to idling. It was extremely easy to start on my back Thanks, Chad Bastian, for placing the pull starter in the same place as the Miniplane. It made it very easy to start. I even stopped it a few times while flying and it was easy to restart in midair. I was surprised how easy it started as well. I felt just a tad of torque on take off as I am only 165lbs. Just a tad when I apply full power. I can just throw my right leg over to my left leg it stops it. I am sure 200+ guy will not notice any. The Apco Harness that is on this machine is very comfortable compared to the Miniplane harness in my opinion. I was not sure if I would like it after flying the Miniplane harness for 100s of hrs. Over all I do like it, I landed and took off 3 times to see how I liked it. So far its a go for me. From "NO STEP - You Can Fly!" Another paramotor in my hands, the already super tested Miniplane features of the 'last of the family of Minari F1 engine, the CORSALUNGA, manufacturing essential frame is explained when you put it on his shoulder, and with surprising lightness fundamental dowry to transmit immediately a good feeling to the pilot, already on the ground! adjusted the shoulder straps and positioned the prm height that there is more congenial we must try the handle switch, which placed there, where it was put to the ignition of the engine for which the Miniplane was conceived, does not make it easier to switch of a double displacement engine, but this inconvenience easily remedied however does not prevent the starting of the engine independently, without the help of anyone who is not the pilot himself. Once the engine is started, which, I say this with personal satisfaction in view of the flying hours that I devoted to find the perfect version from the point of view of the regularity vibration and thrust, running like clockwork and is adjusted from minimum to maximum speed up to achieve a thrust of about 80 kg (a set-up race can reach more than 82 kg, even though this obviously affect the sweetness of the system). in flight is all in place, I tried it with the noble GTR 22, sailing which I personally consider the right answer for those who want to have a margin of indulgence dirty maneuvers, and the ability to squirm in the sky at speeds respectable, and therefore I prefer when I have to try the changes on chassis or engine which does not know the outcome. as I said it is all in place, just the feeling of engine response and the excellent balance of the chassis, leads me to groped to touch the grass with the sail, and then off with a nice loop! the safety net mesh large and tiny wire, make it less subject to air resistance, would please even the engine with less effort that keeps us in level flight, the engine which in turn does not have the slightest problem to take me in up in the sky even at maximum speed, just a minute of full throttle and then descend in a spiral -15ms and come out with a disarming sweetness, thanks to balance the system and to the perfect manageability disbursement of the engine. weight shift is really effective, closer to free flight, but alas we will never be at those levels, the location of the controls perfect suspenders are neither too high nor too low, as they are neither forward nor backward, is all right, as is the eye that is the cleanliness of the whole really pleasant, thanks to the 'aesthetic crispy typical Emilian engine, and the refinement of measures between the rich' engineering and minimal frame. improvable, from my point of view is the position of goodwill, and for those who will come out on NO STEP will definitely at a higher position, and the harness that definitely, always for my point of view, it would be nicer if it was more enveloping although they should let rise slightly weight, not that what we now equips the prm I tried not good, but I would have preferred a bit 'more chubby. essentially what I referred to in my opinion is a real toy, immediate start, power and regularity, light weight and performance ... only flight. No step you can fly !!!!!!!!!! !